A suggestion for fresh first-years and veteran fourthies alike: If you haven’t been to the Renaissance Society, get yourself there now (and if you have, it’s time for another visit). The iconic space, located on the fourth floor of Cobb, has boasted some of the most vibrant and innovative displays of contemporary art in the Midwest, acting as a temporary home to works by Pablo Picasso, Joan Miro, Jean Arp, Marc Chagall, Gertrude Stein, Ed Paschke, and the like. Originally created in 1915 to involve Chicago in the artistic discourse that bubbled in contemporary Europe, the Renaissance Society has since broadened its view to include works from across the globe and has gained international renown for its dedication to promoting new and emerging forms of contemporary art. Though the University’s arts culture is vibrant and expanding, one might wonder what such a prestigious space is doing tucked away in a corner of the quad. However, take a look at the pamphlet for Suicide Narcissus, the Society’s newest exhibition, and something immediately becomes clear: This is not a typical space, nor is this a typical show. In describing the eight-person group exhibition, Hamza Walker, head curator, provides a veritable essay on the nature of reality and perception as related to the individual pieces on display, interpreting and questioning the works in truly provocative ways that often go unaddressed in gallery and museum settings. Take, for example, the first piece one sees upon entering Suicide Narcissus: Lucy Skaer’s “Leviathan’s Edge.” Hanging from the ceiling in an ominous stillness, a baby whale skeleton—bleached, hollow, and overwhelmingly lifeless—beckons the viewer down a white corridor. Freestanding walls block the majority of the view, so one continues on with the assumption that, just around the corner, the walls will end and the full skeleton will come into view. However, no such widening ever occurs; instead, upon rounding the bend, the viewer encounters more walls—more thin gaps of visibility—and, instead of visual clarity, is left with a poignantly frustrating commentary on the relationship between perception and assumption. Skaer’s installation also addresses the issue of man’s damaging relationship with nature, which constitutes the other major theme of the exhibition. In her written introduction to Suicide Narcissus, Walker states, “If only our narcissism were benign. Human and natural history have always been interwoven. The difference at this point in time is that our actions have unintended negative consequences on the natural environment beyond the possibility of mitigation.” That is, the skeleton not only speaks to the viewer’s desire to perceive and analyze, but also to the consequences of his or her actions toward nature—which is at once both thrilling and horrifying, which one wants to free as much as one wants to enclose, which one wants to see as much as one wants to hide. Notions of environmental damage recur throughout the rest of the exhibition in pieces, such as in Katie Paterson’s "All the Dead Stars," a laser-etched sheet of aluminum that depicts all recorded dead stars in a map-like figure that bears an unsettling likeness to a map of the Earth. The show also includes two video projections, one of which—"Spatial Intervention I"—presents a moment that is both predictable and enthralling. 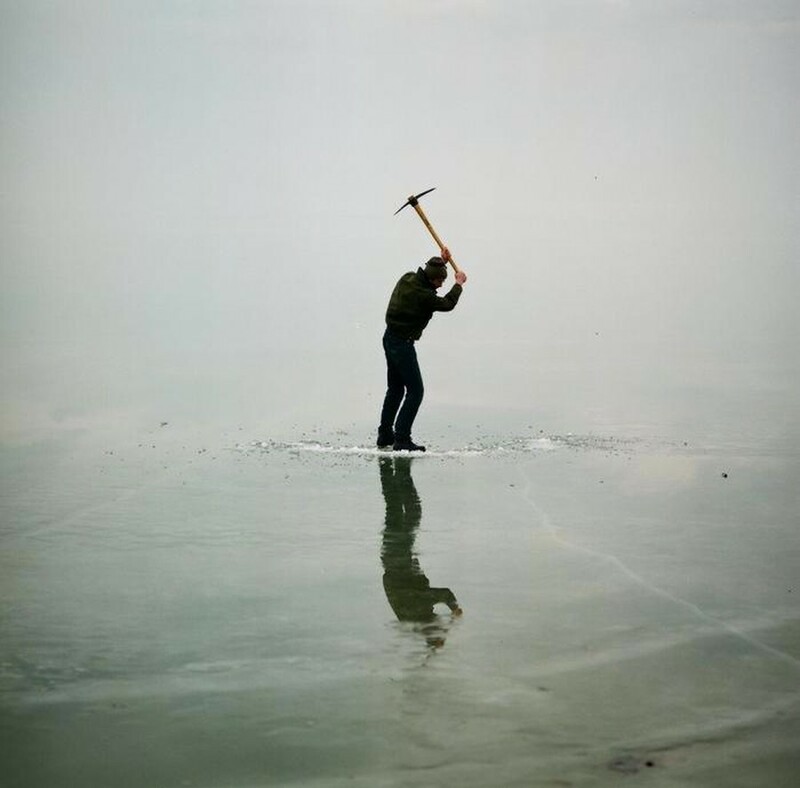 The piece, by Austrian artists Nicole Six and Paul Petritsch, portrays a man, dressed in dark clothing and set against a horizon, standing on a frozen lake as he chisels through the ice beneath with a pick-axe. The setup is wonderfully simple: The viewer is presented with little visual stimulation (one sees only the man, his reflection in the ice, and the watery sky that melts into the frozen ground, creating an eerily flattened plane), and yet the viewer knows what will happen. Similarly, the allegory presented by the video is straightforward: When we abuse the earth beneath our feet, we condemn ourselves. Nonetheless, the video is hypnotizing, and the rhythmic sounds of axe breaking ice resonate throughout the space and spill into the entryway, clashing with the warm buzz of students through the hallways below. Suicide Narcissus is, simply put, an extremely strong exhibition of work from intelligent and courageous artists who have tackled opaque and difficult themes with grace. Everything about the show—from its literature to its curation to its actual artistic material—presents the viewer with clean forms, clear statements, and an overwhelming sense that the people involved in this project are, in every moment and in every sense, in control. To maintain such composure when handling the fatalistic and inherently uncontrollable concepts addressed in Suicide Narcissus is itself a commendable feat, but the artists and curators have done more than stay in command of their tools—they have implicated themselves in the destruction upon which the show is based, and in the process, have implicated their audience as well.